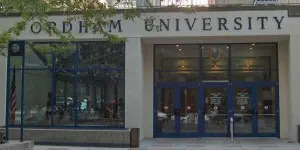 The Fordham Executive MBA program at the Gabelli School of Business is a 22-month program designed to allow busy executives to earn their MBA while continuing their current jobs. Classes for the program meet for one three-day weekend per month, from 9 a.m. to 5 p.m. Friday, Saturday and Sunday. Students register for three courses per term at either the Lincoln Center or Westchester campuses. Some four-day “residential” courses are also held at an executive conference center in Westchester. Additionally, EMBA students are typically required to take one full week off work to attend a five-day “international residential” experience, comprising a week of consulting projects and company visits in a foreign country. For the past few years, the international residential destination has been China. Fordham Executive MBA students must complete eight core courses: Managerial Global Economics, Managerial Accounting, Financial Environment, Marketing Management and Strategy, ICS in the Transnational Firm, Transnational Management and Systems Operations, Contemporary Issues in U.S. and International Business Law, and Business Policy. From there, EMBA students pursue a concentration in Management Systems, which entails taking five further mandatory courses and two electives from a slate of seven courses ranging from International Trade and Development to Contemporary Ethical Issues in Business. The average Fordham Executive MBA student is 33 years of age. EMBA students have typically amassed 11 years of full-time work experience before entering the program and earn salaries greater than $120,000 a year. The full cost of tuition for the EMBA program is $99,750 for both the Lincoln Center and the Westchester intake. Fordham notes that this price is all-inclusive, covering meals, snacks and accommodations, as well as the cost of the five-day international study trip. Fordham graduate students are eligible for both Federal Direct Unsubsidized Loans and Federal Direct Graduate PLUS Loans. Students are also eligible for an array of private loans, which typically require a creditworthy U.S. co-signer. While the EMBA program has no formal requirements regarding work experience or age, the school states that students are typically seasoned professionals with significant work experience who are on the path to key managerial positions. Applicants to Fordham’s executive MBA program are required to submit an online application, undergraduate and (if applicable) graduate transcripts, official GMAT scores, two professional letters of recommendation, a professional resume, a 500 to 750-word personal statement and a $130 application fee. International applicants submitting undergraduate or graduate transcripts written in a foreign language must utilize an official translating service to translate the transcripts into English. International students must also submit TOEFL exam scores — with a minimum score of 600.